Wipro will not get the Central Industrial Security Force cover for its Bengaluru campus because certain demands from the company could not be met by the force. Just before the actual deployment could take place some time ago, CISF and the business firm could not reach a 'consensus' on the duties to be rendered by the force. Sources said the CISF had problems in meeting the requirements of Wipro because it went against its mandate. The force is said to have made it clear that it would be involved in access control duties only but the company wanted it to be involved in other duties also. Union Home Minister P Chidambaram, in May 2010, had announced that a squad of 66 CISF personnel will be deployed to secure the Wipro facility and the force had also conducted a security audit of the complex. At present, the CISF provides security cover to six private sector concerns which include Infosys campuses at Bengaluru, Mysore and Pune, the Electronic City at Bengaluru, Reliance refinery at Jamnagar and the Delhi Airport Metro Private line (Airport Express) in the national capital. "The Wipro task could never see the light of the day as the force found that the access control and quick reaction response could not be performed. Both parties called off the proposed deployment recently," sources in the CISF said. When contacted, a Wipro Spokesperson declined to go into the details of why the agreement could not take place between the two sides. The spokesperson said that their Bengaluru facility is already covered by a CISF cover which secures the Electronic City where the software giants complex is housed. 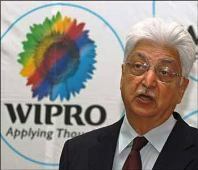 Image: Wipro chief Azim Premji. Will the FM raise tax exemption limits? Will he manage to keep both industrialists and common people happy? To know all about Union Budget 2012-13, Click here! IMAGES: Over 4% of the world's richest are Indians! 'Entrepreneur before 25 or after 25?